An electric powered log splitter is really only a machine that will be used by a small majority of the UK population. If you have a need to split logs for something like a wood burning stove, or a fire, then these make light work of achieving that particular task. The burning question for many, (pardon the pun) is which is the best electric log splitter on the UK market. Like any good politician would say the answer to that is that it depends. The reason we say that, is because there are plenty of choices for these, and it really does depend on your exact purpose for thinking about buying one of these in the first place. We will take you through the detail in this article and explain what is available out there in the UK stores. More importantly we will explain which type you should buy, depending on the purpose that you want to use it for. Hopefully that will help point you in the right direction. Just below we have provided a quick index so as you can jump to any section that may be of particular interest to you. However we recommend reading the whole article if you have the time. If you have the time, then we are sure you will be much better informed after you have read the entire article. We will explain the differences and also show you the brands who make these, along with the most popular and highest buyer rated models of each brand. In the introduction we mentioned the different types of splitter that are available. In this section we will go into a lot more detail about the different types available, and why you should select one type over the other. The vast majority of home owners will pick the electric log splitter, as they are affordable and also work really well for most general log splitting. The manual or old fashioned method of splitting logs was to use a splitting wedge and a sledge or club hammer. Apart from the physical effort that this took, it was also a dangerous thing to do. The hammer could miss, the wedge might dislodge and fly about and the risk of injury was high. For the typical home owner this will always be the best choice. In terms of design, these are usually horizontal log splitters. When compared to the vertical type, the horizontal design is normally smaller, less expensive and is a good solid choice for domestic use. To use these your load the logs onto the machine horizontally. The good news about these is that they are used at about waist height and ideally with a stand. It is worth noting that some models come with a stand otherwise the stand can be purchased as an accessory. These electric splitters are plugged into the main's electric using a standard 3 pin UK plug. The splitter also has a motor which then powers a set of hydraulics, and it is those which move the splitting arm, and it is that which splits the log. These are made by brands such as Forest Master, Logmaster, Mitox and Eberth. You can also buy petrol log splitters which again then use hydraulics as explained above. The splitter in this case is powered by a small petrol engine, instead of electricity. If you are likely to be splitting logs from tougher woods, such as cherry or basswood, then petrol log splitters are likely to be more suitable. Likewise if you plan on working in an area where there is no power source, then a petrol one will always be a much better choice. These are used by a lot of businesses and in the forestry business. They can use a 2 stroke engine, but more often they will use a 4 stroke air controlled engine. These are designed for heavy duty use and can easily split larger logs. There is always the manual option. This type of log splitter is operated by a lever or foot pump. Unlike the two designs above, they do not need electricity or petrol. They are a more simple machine, and really only suitable for smaller volumes of logs. 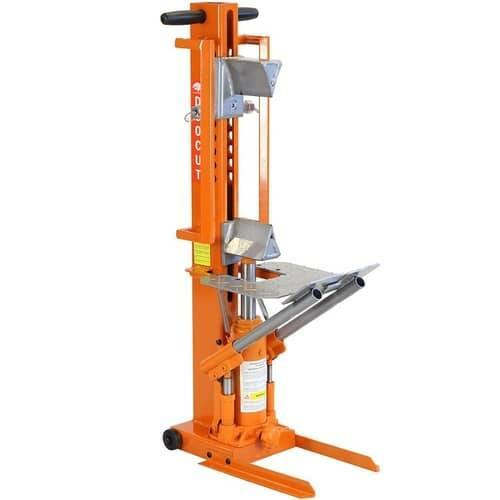 One advantage of these machines is that most models can be used in either the vertical or the horizontal position. The manual version is usually the cheapest option, though they are still expensive enough so you should consider any purchase as an investment. They also have less parts to go faulty. These are a good choice to take to something like a fallen tree, where there will not be any power available. The only other choice to do that is a petrol option and they are very expensive. There is of course models which are called the vertical log splitter. The word vertical refers to the shape and the method used to split logs. These are available as manual, electric and petrol powered options. The reason that you would pick a vertical splitter will be down to the size of the logs you need to cut. Vertical horizontal log splitters can be pivoted into a vertical position and that allows you to roll the log and position it into place without having to lift it. The splitting wedge is built onto the ram and the base is flat so you can roll your log on without lifting. You can lower the splitter end to the ground and roll on a large log. When you're finished splitting the larger log, you can then raise the splitter back to a horizontal position for splitting the chunks into smaller pieces. These are made by brands like Titan Pro and Mitox. 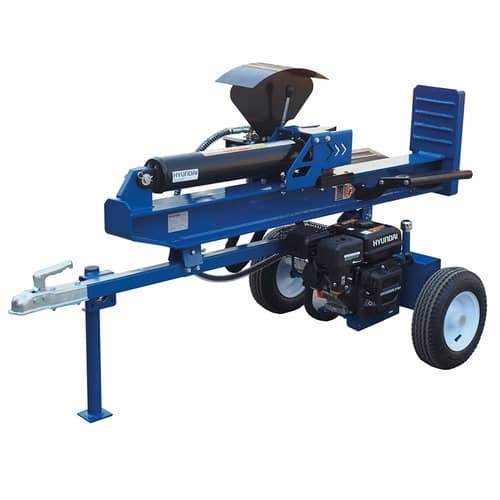 So those are the different types of log splitter that are available on the UK market. The petrol ones are used mainly for commercial purposes or in the forestry business. Unless you have a lot of logs to get through on a regular basis you will not need the petrol option. These are an expensive buy at around £2,000 for the machine. That leaves most home owners with the choice of either a manual or an electric log splitter. If you need one where there will be no power, then you should buy a manual one. If you are going to be using it in a yard or somewhere there is power, ten we would recommend an electric option as it involves less manual effort, and is faster and more efficient. Just below you will find a top 5 table, where I have rated these electric log splitters based on buyer ratings. Some buyers will leave reviews and also rate their purchase. They do this from a variety of online websites. What I do is look at those and then summarise what they say. That should save you some time doing your own research. In the table below you will find the product name, the average online buyer rating, and an average price. By clicking on any of the product name links you can then read a more detailed review of each electric splitter. Underneath we have done a summary review of each of the log splitters in the table shown above. All buyers said that this just takes a few minutes to assemble and then you are ready to go. It is very easy to use and aso very easy to maintain. This model is from the highly reliable Logmaster. According to buyers this splitter is well made and feels sturdy. Buyers use this for home use, or at holiday homes. At number 2 on my list, this one gets very good reviews and it is certainly at the lower end of the price scale for these types of splitters. It is easy enough to assemble. This is a good choice for smaller logs and those looking to split logs for wood burning stoves and fires. At number 3 on my list is this 6 tonne machine from the popular Logmaster brand. It comes with a stand and that means you don't have to do a lot of bending. This is a heavy machine so best to get some help when setting it up. All the buyers agree that this splitter is a well made and robust machine. They also said that this one is heavy and the wheels help a lot when it comes to moving it around. It is however easy enough to handle and also very easy to use. It does make very light work of splitting logs. This product is heavy enough but will be manageable for most people. Overall buyers have given this mower good reviews but there are some niggly annoying things such as connecting the battery, and the fact that the side discharge chute comes off too easy. Buyers said that it started well and started every single time. It is a great work horse but the mower is heavy. If you are not sure about the benefits of a log splitter, then this is a great choice for beginners. It is also a great choice for anyone with a small to medium sized wood burner. Below I will offer you some important tips for buying a log splitter. As mentioned earlier there are manual types (horizontal and vertical, and the more popular choice is the electric log splitter. Manual ones cost anything between £60-200 depending on which type you buy. 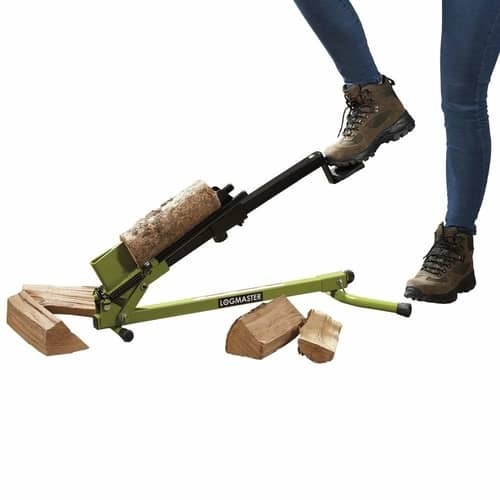 The electric log splitters do all of the manual work, but these range in price from £200-350 depending on what force (measured in tonnes) that you want to have. A good quality log splitter ensures that you have a safe method of splitting logs. The manual products are as you can see a cheaper option, but still require a high degree of manual intervention. The electric option take all of the back breaking work out of splitting your logs. With the huge majority of log splitters they will split a log into two pieces. You can then buy, usually as an optional extra a cross wedge which is actually a 4-way wedge. This is positioned, also known as a cross-wedge. This can be placed over the 'axe head' of your log splitter and it will make the log split into 4 smaller pieces. This is an accessory that is often over looked, and it can really save you a lot of time and effort. The horizontal is aimed primarily at the UK domestic market. They will be smaller and cheaper than the vertical option. You simply load the log on to the splitter horizontally. The majority of these horizontal machines will come with a stand, though with some models, you will have to buy this as a separate item. As we mentioned earlier the vertical options are mainly used by commercial businesses and in by those working in forests. 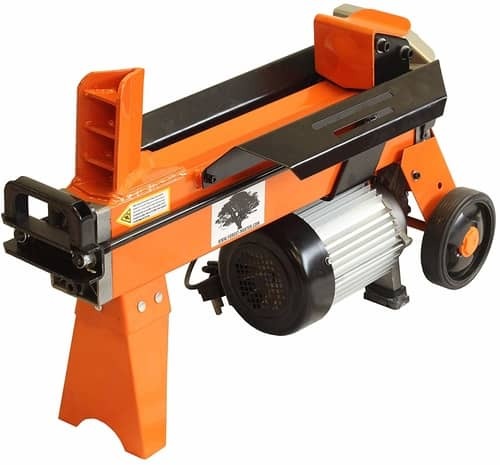 They are designed to split larger sizes of logs, or if you are log splitting in big quantities. They are almost always much larger and heavier than the horizontal type. The force exerted on a log is what makes it split. The more of that the better in most cases. You certainly need a bigger force for the larger logs of for hard woods and any "green logs." Force is measured in tons and the bigger the better when it comes to splitting a log. 4-6 tons are ideal for splitting logs that are under 6-8". For 12" logs you will need 7 tons. It is also worth noting that freshly cut logs have usually a lot more moisture in them. They are often referred to as "green logs." Those are harder to split than a log, usually called a seasoned log, as they will have had a chance to dry out. When you are considering buying an electric log splitter, manufacturers refer to what is called cycle time. This is the length of time from when you activate the ram, splits the log and then returns to the original position. A time of around 10 seconds is normal for an electric splitter. This is measured in watts. An average motor size is around 2,200 - 3,000 watts. The bigger this motor then the more power it can generate without placing a heavy load on the motor. That means that the motor will last longer if it is not constantly working to its maximum capacity, all of the time. Most people who buy a log splitter for home use will most likely be using it close to home. Having this splitter located on a stand will really save you having to do a lot of bending, and that makes the task a great deal easier on your back, arms and legs. Likewise if there are wheels on the stand then that helps move the splitter around. These machines are heavy and you don't want to be lifting them. Wheels are also useful when it comes to storing your splitter in a shed, garage or any type of out house. If you have split logs with an axe, or an axe and wedge, then at some stage that will have gone slightly wrong. A missed stroke can result in a sore shin or toe. A log splitting the wrong way can result in a flying object cracking your head. One of the main reasons people buy a log splitter is just to make this operation safer. Follow the safety guidelines that comes with your purchase, and you will always be safe. Most of these types of mowers have fixed handles. They can be wheeled inside a garage or larger shed and left there. Some people simply use a couple of larger hooks on the wall to hang them up. Ideally though the mower should have a handle that folds in the middle. That way they take up less room.